MacGregor has won the contract to deliver North Star, an engineering marvel that takes guests to new heights with a jewel-shaped, glass capsule, transporting them on a spectacular journey more than 91 m (300 feet) above the ocean and over the sides of the ship to deliver awe-inspiring 360-degree views for Royal Caribbean International's first Quantum Class cruise ship, Quantum of the Seas. 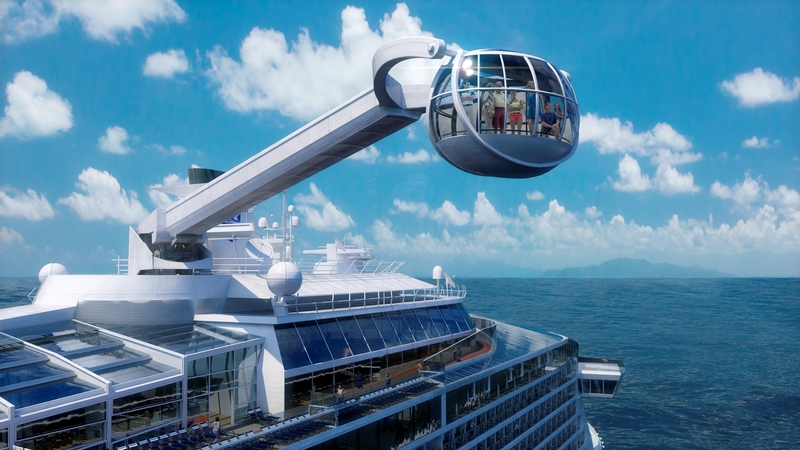 The crane's slewing function will also allow the viewing gondola to be swung out over the sea for a unique guest experience. The order was booked in the second quarter 2013 order intake. Quantum class will debut in fall 2014 with Quantum of the Seas, followed by her sister-ship Anthem of the Seas in spring 2015. Quantum ships span 16 decks, encompass 167,800 gross registered tons, carry 4,180 guests at double occupancy and feature 2,090 staterooms. Quantum of the Seas will sail out of the New York Harbor from her homeport of Cape Liberty on 7- to 12-night itineraries during the winter 2014/15 season. The ship is under construction at German shipyard, Meyer Werft and is scheduled to make its debut crossing from Southampton to New York in autumn 2014. The electro/hydraulically-driven crane will have an outreach of 41m, and the 7.1-tonne viewing gondola will be able to accommodate 14 guests and one crew member. The gondola will be fitted with a stabilising system to ensure that it remains level with respect to the vessel's deck. It will also damp gondola movements, providing a comfortable ride for the guests. "We are the first crane supplier involved in anything like this type for a cruise ship," says Jonas Hägglund, MacGregor Sales Manager. "Safety is paramount, and the operator needed a crane supplier that would not only deliver the highest safety standards, but also proven, reliable technology for the North Star guest experience." The system is designed for 100 percent redundancy with two separate power units, each large enough to drive the crane in reduced speed mode; it will also be provided with a diesel-driven emergency power pack. Additional safety features include automatic cut outs and safety valve overload protection on all crane motions. The crane is designed to standards set by German technical certification company, TÜV süd. North Star will be controlled using a separate PLC safety system in addition to a MacGregor CC3000 crane control system. "The CC3000 provides excellent load control and can easily be adjusted with a laptop computer for different parameters, such as speed ramp times," says Mr Hägglund. "All crane movements will be smooth and immediate, with stepless speed control, essential for this type of guest experience. It is also important that the experience is as quiet as possible, so the main power pack will be rubber-suspended to minimise vibrations and noise transmission; the crane housing will also be isolated to minimise noise. "Given the vessel's cruising areas, the system is fitted with an air-type cooler to keep the crane's hydraulic oil at a moderate temperature even in very hot ambient conditions; this ensures a long oil life and reliable crane performance," he adds.